t may still be hot outside, but you can’t deny the light is slowly changing and the temps are starting to dip just a little. Fall is our favorite season, from the food to the clothes to all the house cozies. We look forward to it every year, and this year we’re extra excited because we’re finally settled in our house, and it feels like we’ll be here a while. It feels like home. So we thought we’d discuss five ways to get yourself and your house ready for fall. Let’s dive in. Even though we just moved in a little over a year ago, we’re making big changes to our master bath with the help of our friends at Delta. When we renovated our home last year, it was for a television pilot and the filming schedule was STRICT. We had to have everything done in a tight time frame, and because of that, we weren’t able to completely renovate our master bath the way we wanted to. We ended up going with two pedestal sinks in lieu of a double vanity because our cabinet maker didn’t have time to build the one we designed, and we went with less elevated faucets that were pretty, but not the exact ones we wanted for our master bath. So here we are, one year later and ready to tackle another renovation, though this time we’re just making subtle changes that will have a big payoff. Isn’t it crazy how changing one or two things in a room can completely transform a space? We love a good before and after and this one won’t disappoint. So let’s get right to it! 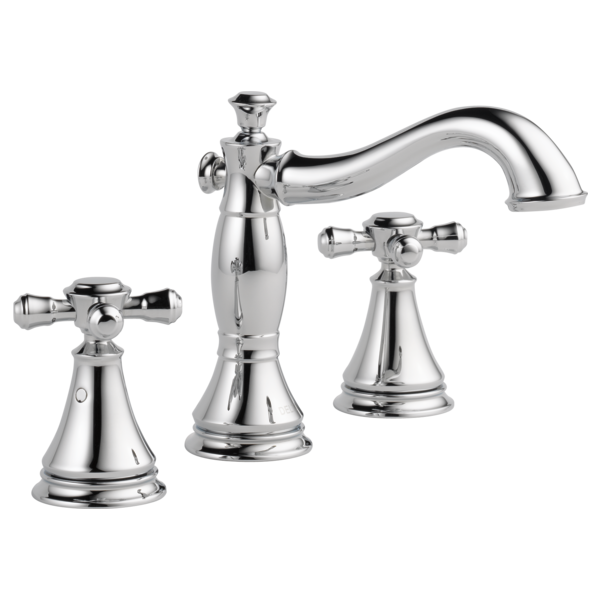 Our plan is to switch out our old faucets with a new, high-end Delta faucet that will better match the overall feel of this old craftsman style home of ours. 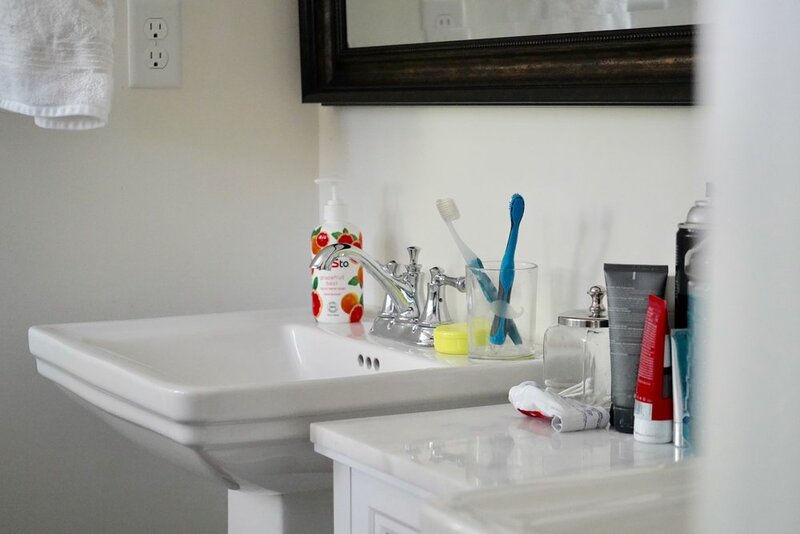 We went with mostly traditional, classic style & décor in all of the other rooms in our house, and we want to make sure that cohesiveness is reflected in our master bath as well. For that reason, we’re going with the Delta Cassidy Collection. It’s more traditional (you know our feelings about traditional styling) and features clean lines & elegant design details, something we desperately wanted for our bathroom. We want the space to have that spa-like quality to it, a place where as soon as we walk in we immediately feel relaxed. After we decided which collection we were going with, we began to look through the different options. In the end we confidently chose the Two Handle Widespread Bathroom Faucet with cross handles and we’re so glad we did! We felt the classic shape of the cross handles, the beautiful curve of the tall spout, and the chrome finish were the perfect mix of old meets new. They have the glamour and high-end look we were craving and honestly would be something you would have originally seen (or a version of them, at least) when our house was built back in 1924. They won’t look out of place and are very much in line with the rest of the design of our house, and that was important to us. Along with the faucets, we are also replacing the pedestal sinks with a wood stained double vanity for added storage. Like we mentioned, our cabinetmaker wasn’t able to get to that in time last year, so we’ve been living with two sinks that provide absolutely zero storage. We got by adding a small cabinet, which works alright, but even that isn’t ideal. It’s wobbly, so we leveled it by adding a flossing tool underneath the foot so it doesn’t shake. Comical, right? We’re going with a Carrera marble countertop (to match our marble window ledge directly across from the vanity) and finishing the room off with chrome hardware to match the lights and faucets. We are also considering adding a few shelves to the bathroom for even more storage. Maybe above the toilet? Or a long one in the middle of the windows to set plants on? We haven’t decided entirely on that just yet, but we’ll let you know when we do. What we DO know, however, is the feel we want our bathroom to have. We want it to feel like an oasis, like we’re bringing the outside in. Our biggest inspiration for this reno is water and the way we use it every day. We are going with natural elements with things like the slate-like floor tile, the wooden vanity, and the use of stone in our marble countertops. We plan to incorporate more plants in the finished space, too, to add a touch of nature because let’s be honest, every room deserves a little green here and there. To complete the room, we’re bringing in new washcloths and towels to freshen the space up. We are so excited to get started on this project, y’all. The vanity has been built and was just installed a few days ago, and our brand new Delta faucets just came in the mail last week! This has been a year in the making and we can’t wait to show you the finished results. Stay tuned to see how it all comes together! We came across this brownstone this past weekend and haven't been able to get it out of our minds since. We have a thing for Brooklyn brownstones (the character! the history! the layout!) and this one definitely doesn't disappoint. Is it not the most cozy-cluttered home, but in the best possible way? Loving the library sconces over the bookcases, and how about the chandelier that's shaped like an old pirate ship? Don't even get us started on that fireplace. It's four stories, has five bedrooms, and is 16.5 ft wide. It was listed for $5.25 million back in Feb 2017 (wonder if it sold?) so it was/is a bit out of our price range, but we can dream can't we? PS: how to get the style of a Brooklyn brownstone in your own home. The air has been considerably cooler lately and a false fall seems to be creeping in for a few days. With even the hint of fall, we couldn't help ourselves and did something to accelerate that feeling in our house. After being here a year, we realized we almost never turn that chandelier on when we're eating. We usually stick to either the overhead recessed lighting or the two sconces on the wall and our two lamps for a cozier, more inviting vibe. Why, you ask? (Assuming you asked us because you're on the edge of your seat wondering what happens next) The reason is because the light our chandelier put off was too. dang. stark. And bright. And harsh. In short, it hurt to look at and definitely didn’t feel inviting to eat under when it was on. Once we realized this we have been on the hunt for the perfect replacement ever since. We also wanted something more substantial. Our old chandelier felt too thin for the room. We needed something a little bulkier. You were beautiful to look at black & wood colored chandelier, but you just weren't the right fit for us. Enter Hudson Valley Lighting. They have SO many options for every kind of light you can think of: wall sconces. flush mounts, pendants, table lamps, picture lighting, and of course, chandeliers. They offer literally thousands of different products from various companies so you're guaranteed to find the light you're looking for. It was actually really fun to go through all the options until we found the one we felt would look perfect in our dining room. And one of the best parts of the whole process was each chandelier usually has 2-3 different finishes to choose from, so you have some options. So more on why we chose the chandelier that we did. We were looking for an aged brass chandelier to offset our black sconces that we have above our buffet. We also wanted one that had shades on it to create a cozier atmosphere with more ambient lighting, lighting that would encourage intimate dinners with friends and family. After searching through so many lights, we finally settled on the perfect one. We ended up choosing the Charlotte chandelier in aged brass and we absolutely love it. It's sophisticated, charming, and puts off the coziest, warm light that's been perfect for late night dinners. Also, aren't the little shades so cute? If you're looking for your gorgeous lighting options for all rooms of your house you should definitely check out Hudson Valley Lighting. We are so in love with our new chandelier and we can't wait to get more lights for other rooms in our home! Happy Friday!! How has your week been? PJ has been out of town all week working on an exciting new project with our friend Brian Patrick Flynn. With PJ gone, Thomas has been spending a lot of time with his family and catching up on some much needed house cleaning. What are you up to this weekend? We have a few friends coming to stay with us, plus PJ gets back into town (!!!) so it should be a fun weekend. We've been digging some items recently and we can't get them out of our heads. We think you'll like them, too. Check them out below and click the pictures to shop! This nautical inspired bedside table that we ordered two of for our guest bedroom. This fun-shaped wooden end table that we also recently got from Wayfair. It's even more beautiful in person. How fun are these linen pants from Gap? Perfect for summer don't you think? We've been really into decorating with tans lately, so we can totally see this vase from Target on our bookshelves in our living room. We're not normally into fake plants, but for $8, you can't beat this faux succulent that looks real enough that no one would even notice. An oldie but goody, this lamp from Threshold is a cheaper alternative to similar lamps by Pottery Barn and West Elm. 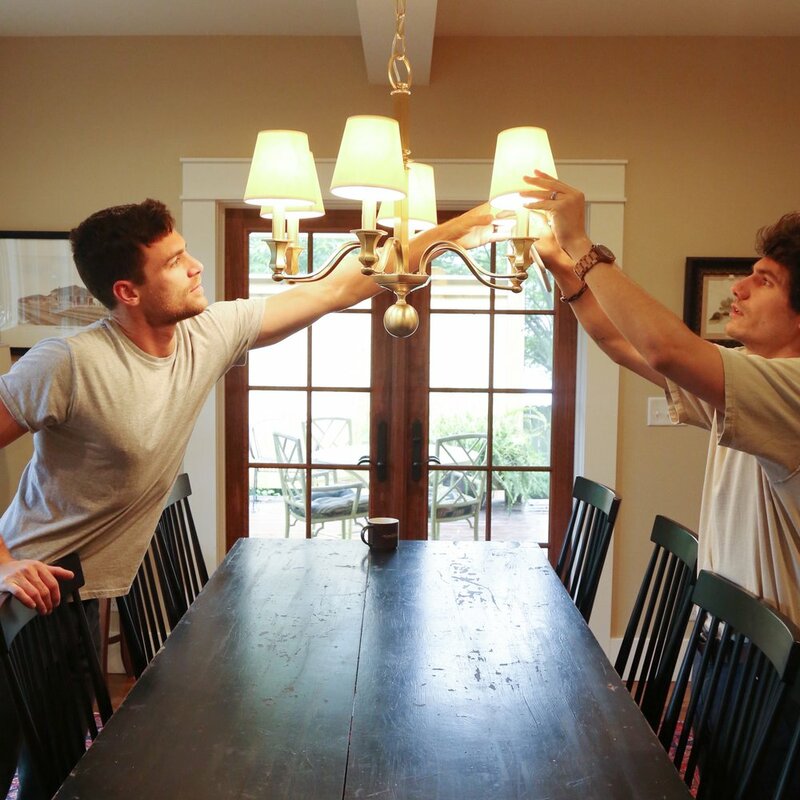 We have two of these lamps in our house and love them. We hope you have a wonderful weekend, friend!